Improve the operation of your fireplace and increase the safety of your home. Smoktite is a highly insulative ceramic product that is used to seal, smooth and insulate chimney smoke chambers without removing the damper frame or adjacent brickwork. Smoktite sprays on to seal the surface with a durable ceramic coating that is good up to 2291 degrees Fahrenheit and is impervious to acids, vapors, and water. Introduced in the summer of 2002, Smoktite is now being used by chimney professionals all across the country. Faster, easier, and more cost effective. The smoke chamber is a commonly overlooked chimney area that is the source of a high percentage of chimney fires. With Smoktite, chimney professionals can now seal smoke chambers through a process that is faster, easier and more cost effective. Increases the safety of a home, improves the operation of the fireplace, and protects the smoke chamber. Repairs damage easily, without the removal of the damper frame and adjacent brickwork — no more hand-troweling! The Smoktite system is lightweight and portable enough to be in every chimney professional’s service truck. Get to those hard to reach areas. Get to those hard to reach areas with ease with our “Extender” model spray gun, a component system that can be extended in length by 6″ increments that will reach virtually any part of any sized smoke chamber. The Extender comes in sleek, professional machined components for a maintenance free fit. Can be used in multiple lengths. Reaches hard to access areas without removing the damper and/or the surrounding masonry. Eliminates the need for demolition. Smoktite is easily mixed using cold water. Cleanup is quick and easy. ALWAYS read all instructions completely before mixing or using the Smoktite product, or equipment. This ensures the proper results. Download a PDF of the Smoktite Mixing Instructions. 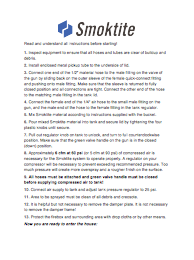 Download a PDF of the Smoktite Equipment Instructions. 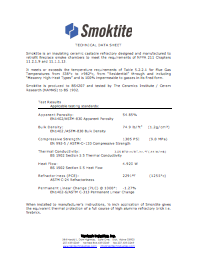 Download a PDF of the Smoktite Technical Data Sheet. 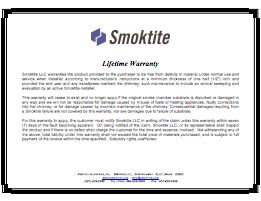 Download a PDF of the Smoktite Warranty Certificate. 1. What equipment do I need to use Smoktite? You’ll need a compressor with a regulator that’s rated at a minimum of 5 SCFM @ 90 PSI , a ½-inch drill with a mixing paddle and cold water. Water is used to mix the Smoktite and to clean up. 2. What preparation of the smoke chamber is required prior to application? A thorough brushing and/or rotary cleaning will usually suffice. 3. Does the equipment clean up easily? Yes! Clean up with water is easy when done promptly after each use. 4. Once mixed, how long do I have to use it? The average pot life is about one hour but varies with weather conditions. 5. Has it been tested? Yes! It has been tested to 2291°F. It is a highly insulative and lightweight agglomerate. 6. What kind of coverage will I get with Smoktite? One bucket will cover approximately 10 square feet at 1/2 inch thick. 7. How many coats does it take to complete a smoke chamber? Usually, one to two coats. Additional coats may be necessary for severe problems. 8. How long do I have to wait between coats? If multiple coats are necessary, approximately 10-15 minutes is recommended. This is variable depending on temperature and humidity. 9. Will it seal holes? Yes! It can seal holes up to 1 inch with a little effort. 10. How does Smoktite compare to other products and methods? Smoktite is the original spray system for smoke chambers! 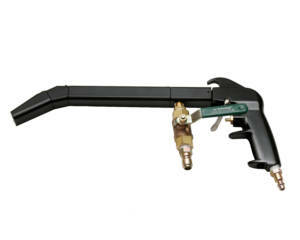 Our high quality equipment is designed specifically for spraying Smoktite material not just off the shelf. The gun components are CNC machined in house to exact specifications for our particle sizes. Being a sprayed ceramic, Smoktite is quick and easy to apply making it more cost effective than traditional parging methods.. I started sweeping chimneys in 1975 thoroughly convinced that the best defense against a chimney fire was a combination of good chimney maintenance and an educated consumer who used good burning techniques. My opinion today remains unchanged even though a whole new industry was born based on the lack of proper maintenance and uneducated consumers. I abandoned the maintenance end of the business in 1980 and built a successful poured masonry lining/relining/ construction company. We ran four crews year round and continued relining thousands of chimneys through the ’90s when we began vastly expanding our research and development. Ultimately, we ended up in the manufacturing business, with the help of Allan Barnes of Bradford, England, when we introduced our first product, Thermocrete. As we have developed and improved our products over a period of several years, it came to our attention that a very important area was generally being overlooked by the industry: the smoke chamber. Over and over again in conversations with professional sweeps from across the country, we found the smoke chamber was a major area of concern. Improperly built, poorly functioning, misunderstood by the home owner and difficult to repair, the complaints were endless. Add to that the fact that it is not a visible danger and many homeowners balked at the prices being charged to make the necessary repairs. At trade shows and workshops sweeps approached us for ideas and help. These requests, together with the interesting philosophies of a guy by the name of Ken Robinson, got me thinking. In my 30-something years in the fire service, I had never seen a structure fire as a result of a chimney fire in a lined chimney but I had seen many structure fires as a result of bad smoke chambers in “lined-to-code” chimneys. I checked with others in the fire service and it seemed to be a common problem – a dangerous problem – that was missed completely due to the generalized wording of the fire reporting system that developed the national statistics we all used. 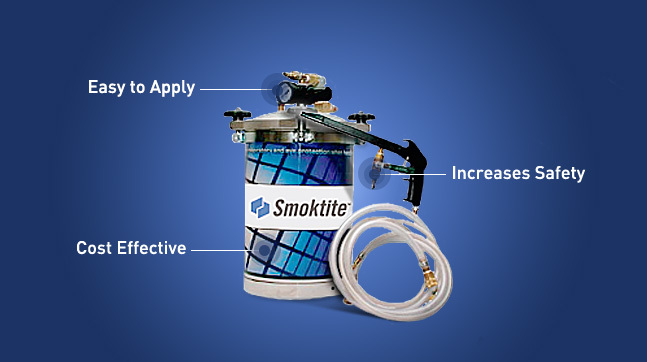 Smoktite is a new highly insulative ceramic product that is sprayed on smoke chambers sealing holes and gaps and creating a coating that is impervious to acids, vapors, and water and it’s good to 2291 degrees Fahrenheit! Smoktite was introduced to chimney professionals in the summer of 2002 and is now being used by hundreds of chimney professionals across the country. The Smoktite system is not only easier than other options, but also lightweight and portable enough to be on every sweep’s service truck. Smoktite can be used to seal, smooth and insulate a smoke chamber — without removing the damper frame or adjacent brickwork. This is especially helpful for technicians installing stainless steel linings in fireplaces because Smoktite allows them to seal the bottom termination and the complete smoke chamber in one simple operation. We started in this service industry reacting to the needs of the community. Because we knew there had to be a better, easier way, we started digging for information and knowledge, probing codes, talking to other professionals. To really be of service to our customers, we needed to be pro-active which drove us further into research and development. Then we had to find a way to share this knowledge with our colleagues. We are exceptionally pleased to have introduced a product that simplifies the work day of “the chimney guy”. We worked hard to get it right. We tried to go the extra mile to help our chimney professionals educate their customers by including free literature with diagrams to explain the process. We are truly gratified to get calls and letters from these same tradesmen who just want to say “Thank you” or give us a pat on the back. Bob Martin, Atlantic Chimney, Inc.
Barbara Marx, The Chimney Sweeper Corp.